A recent national songfest saw students from across the Territory join with others across Australia to sing the same song at the same time. For the first time in the history of ‘Music: Count Us In’ the chorus of a song was converted into Indigenous languages — Kunwinjku, Warlpiri, and Kriol. The Warlpiri translation, undertaken by Yuendumu School, became part of a rendition on a nationally broadcasted webcast, and at the Alice Springs Convention Centre on 3 November 2016. The song, Let It Play was written by students from Western Australia, Victoria and Queensland. 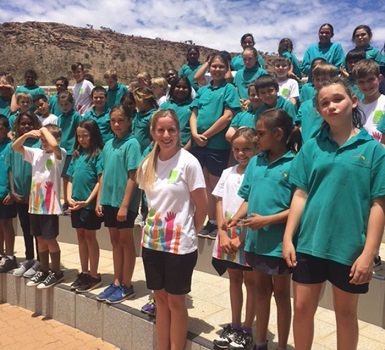 Students from Yuendumu School and Acacia Hill School joined those from Larapinta, Bradshaw, Ross Park, Braitling and Sadadeen primary schools, to celebrate the songfest.